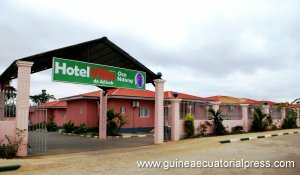 The Hotel Ecoro Nsang and the residential villas Osa Ndong have become the first works in Añisok to be inaugurated by the Head of State in the framework of the activities of the 34th Anniversary of the Freedom Coup. In the presence of a group of guests, the ceremony began with the speech by the president-director general of the company Preguis S.L., Jeronimo Osa Osa Ecoro, who acknowledged that the date of August 3, 1979, represents the national event that, in addition to returning the Equatorial Guinean people to freedom, dignity and rights lost in the past, has led the way to the highest aspiration of President Obiang Nguema Mbasogo, in his willingness to give all Equatorial Guineans the opportunities for them to take positive action and initiatives to end the state of moral, social and material decay that the people of Equatorial Guinea had in the past. The President of Preguis described this work as his contribution to achieving the objectives set by the building and construction policy in our country, as advocated by H.E. Obiang Nguema Mbasogo since taking the reins of the nation. In this inaugural ceremony the guests were informed by the Delegate Minister of the Culture and Tourism Department, Guillermina Mekuy Mba, about what this department has worked on in recent years to provide the country with important infrastructures, such as human resources training to improve and the orderly plan for sustainable tourism development, and the preparation of the National Tourism Directive Plan, which determines the path of the sector in Equatorial Guinea for the next five years. 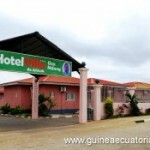 -“The country’s development cannot be expected to be only in the public sector, the private sector should also make a contribution,” said the Head of State when congratulating the promoter and financier of this work, Jeronimo Osa Osa, while inviting everyone to imitate this example to drive the development of the Republic of Equatorial Guinea. President Obiang Nguema Mbasogo also urged officials of the Department of Culture and Tourism to develop plans that promote the development of tourism in the country. The event concluded with the cutting of the ribbon and visits to the facilities of the resort, which has 36 rooms, a bar-restaurant, disco, offices and twenty residential villas.